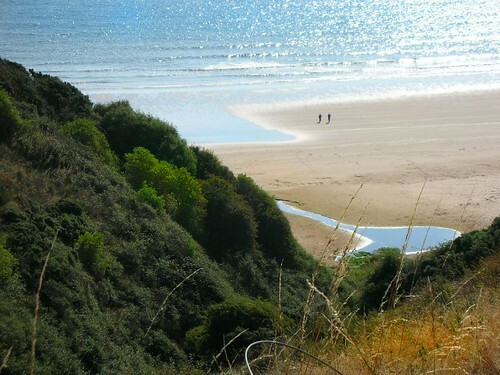 Lunan Bay and the beach at St Cyrus are two of the best beaches on the east coast of Scotland. At least from what I have seen so far. Lunan Bay has lovely sand and dunes set back from the sea, and is shaped like a big horse-shoe with clifffs at the north and south. In the middle is Red castle. St Cyrus has an equally lovely beach but the village itself lies at the top of the cliffs. This entry was posted on Monday, September 12th, 2005 at 11:28 pm and is filed under Scotland, trail, walk. You can follow any responses to this entry through the RSS 2.0 feed. You can leave a response, or trackback from your own site.